I have a NVIDIA GeForce GTX 745 graphics card, which has one DisplayPort and one HDMI port. My NEC PA322UHD is connected via DisplayPort and my NEC EA275UHD is connected via HDMI. Error: The level of the video being input to the display is not correct and the calibration is unable to continue. The video signal appears to be configured for an HDTV and not for a display monitor. 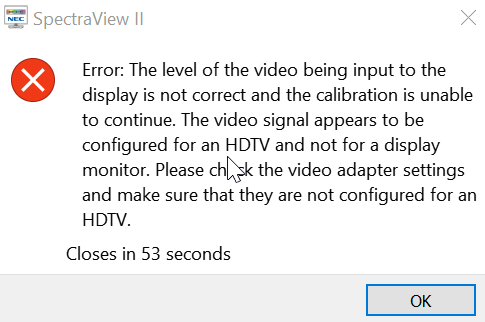 Please check the video adapter settings and make sure that they are not configured for an HDTV. Click Display -> Change Resolution in the left hand tree nav. Under, Apply the following settings. 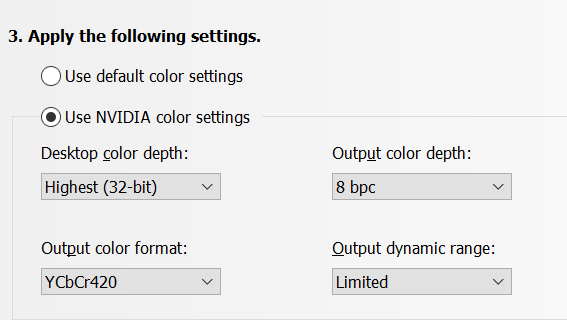 Select “Use NVIDIA color settings”. If “Output dynamic range:” allows you to select “Full”, then do so, otherwise leave as “Limited”. Click Apply in the lower right. Open SpectraView and calibrate the monitor. (You might need to restart SpectraView).